Tom Toles is the Washington Post‘s cartoonist, but he also writes a column. Today’s column caught my eye: Paul Ryan: Eddie from the Munsters wants to grow up to be a real monster. Bwahahaha! 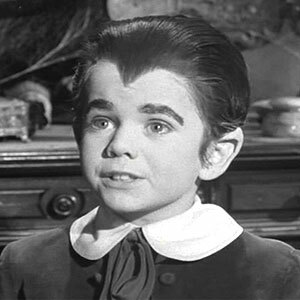 I have been using Eddie Munster for Paul Ryan for years. More on Toles’ column below, but first, a word from the professor. Paul Ryan is not, repeat not, a serious, honest man of principle who has tainted his brand by supporting Donald Trump. He has been an obvious fraud all along, at least to anyone who can do budget arithmetic . . . Yet he poses as an icon of fiscal probity. That is, he is, in his own way, every bit as much a fraud as The Donald. But it’s the audacity of dopes. Mr. Ryan isn’t offering fresh food for thought; he’s serving up leftovers from the 1990s, drenched in flimflam sauce. So how has he been able to get away with this? The main answer is that he has been a huge beneficiary of false balance. The media narrative requires that there be serious, principled policy wonks on both sides of the aisle; Ryan has become the designated symbol of that supposed equivalence, even though actual budget experts have torn his proposals to shreds on repeated occasions. And my guess is that the media will quickly forgive him for the Trump episode too. They need him for their bothsidesism. After all, it’s not as if there are any genuine honest policy wonks left in the party that nominated Donald Trump. They must schedule elections near Halloween for a reason. And at this time of year it becomes irresistible to note the unusual resemblance of House Speaker Paul Ryan to young Eddie Munster. Like little Eddie, Paul is outwardly well-behaved. He is always talking about budget responsibility, though his math homework, whenever it is actually graded, gets a D for Deficits. Also like Eddie, he is proud of his dad, and this season Herman Munster is being played by Donald Trump. While some recoil in horror, Paul has been studying and knows the script. Trump may be a monster, but he also might just become a president. The avid gleam in Paul’s eyes is also reminiscence of Trump’s actual sons, Eric and Donald Jr., the look of a vampire examining your neck. And how could the season end? Oh, perhaps with an unholy alliance of Paul and Donald. Say goodbye to action on the climate. Say goodbye to health insurance, say hello to another round of gigantic tax cuts for the rich. 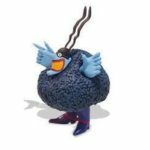 The creaking sound you hear is the coffin lid opening. If Donald Trump is elected president and Republicans hold onto Congress, House Speaker Paul Ryan is bluntly promising to ram a partisan agenda through Capitol Hill next year, with Obamacare repeal and trillion-dollar tax cuts likely at the top of the list. And Democrats would be utterly defenseless to stop them. Typically, party leaders offer at least the pretense of seeking bipartisanship when discussing their policy plans. But Ryan is saying frankly that Republicans would use budget reconciliation — a powerful procedural tool — to bypass Democrats entirely. It’s the same tool Republicans slammed Democrats for using to pass the 2010 health care law over their objections. While GOP leaders have made empty threats to use reconciliation to repeal Obamacare in the past, Ryan is making it clear that this time he plans to use it when it counts. And he would likely have support from a Trump White House. Larry Kudlow, an economic adviser to the GOP presidential nominee, said he is also strongly urging Trump to embrace reconciliation in order to pass sweeping tax cuts. Ryan peeled back the curtain on his strategy at a news conference last week after a reporter suggested he would struggle to implement his ambitious agenda next year. 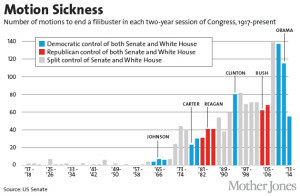 After all, it was noted, Republicans are certain to lack the 60 votes needed in the Senate to break Democratic filibusters on legislation. So Ryan gave a minitutorial on congressional rules and the bazooka in his pocket for the assembled reporters. “This is our plan for 2017,” Ryan said, waving a copy of his “Better Way” policy agenda. “Much of this you can do through budget reconciliation.” He explained that key pieces are “fiscal in nature,” meaning they can be moved quickly through a budget maneuver that requires a simple majority in the Senate and House. “This is our game plan for 2017,” Ryan said again to the seemingly unconvinced press. The Beltway media are simps. The Septuagenarian Ninja Turtle, Mitch McConnell, abused the filibuster (cloture) rules of the Senate in an unprecedented manner during his term as Senate Minority Leader. If he is still the Majority Leader of the Senate in 2017 with a Donald Trump in the White House, totalitarian Tea-Publicans will suddenly announce that they are doing away with the filibuster (cloture) rules of the Senate, or imposing severe limitations on them, to disempower their Democratic opposition. The “Party of No” obstructionists of the Obama agenda for the past eight years will overnight become hyper-active totalitarians who will impose their far-right agenda by a Triumph of the Will. Democrats and progressive advocates are not so skeptical. Terrified might be a better word. “I’m extremely concerned,” said Harry Stein, director of fiscal policy at the liberal Center for American Progress. Here’s how the process works: If the House and Senate pass identical budgets, they can include broad instructions for Congress to pass reconciliation legislation that has privileged status and cannot be filibustered in the Senate. The bill is intended to change current law to comply with the budget’s directives and must abide by certain parliamentary rules, such as having some effect on spending or tax levels. But ultimately a broad swath of policy changes can be made. “There’s an enormous amount you can do under reconciliation,” Stein said. 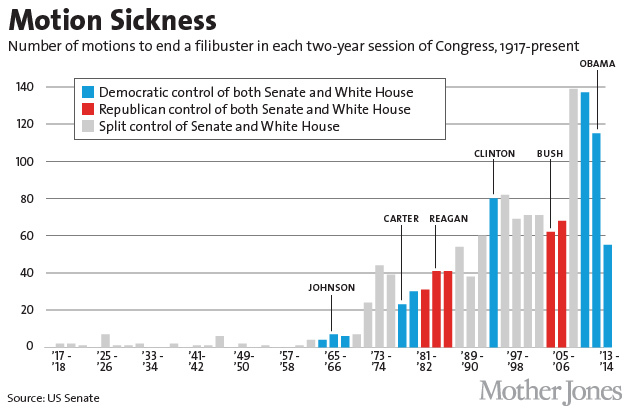 Both parties have used budget reconciliation in the past. George W. Bush’s trillion-dollar tax cuts were passed under the procedure in 2001 and 2003; Democrats used it in 2010 to finish passing Obamacare, with Republicans rebuking Democrats for running roughshod over the GOP. A senior Senate Democratic aide said it was “the height of hypocrisy” for Republicans to plan to use reconciliation after their previous complaints. “Winning back the Senate is critical for Democrats to stop Republicans from ramming through deep cuts to earned benefits programs,” the aide said. An aide to Senate Majority Leader Mitch McConnell didn’t weigh in on the matter, noting only that no announcements have been made about next year’s budget process. But Republicans have already done a dry run on targeting Obamacare. The GOP-controlled Congress passed a reconciliation bill last year that would repeal key parts of the health law, including effectively eliminating the individual and employer mandates and scrapping the Medicaid expansion, insurance subsidies for consumers and the medical device and Cadillac taxes. The bill was promptly vetoed by President Barack Obama, but it would serve as a road map to Republicans in 2017. The reconciliation process relies heavily on precedent, so now opponents of Obamacare already know what can pass muster with the Senate parliamentarian. Notably, the bill also defunded Planned Parenthood for one year, in a sign of how expansive a reconciliation bill can be. Other pieces of Ryan’s “Better Way” policy agenda that could find their way into a reconciliation measure are controversial proposals to bring down the costs of Medicare and Medicaid or overhaul the food stamp program and housing assistance for low-income renters. Every line of the bill would face scrutiny from Democrats, but a skilled procedural tactician could overcome most parliamentary challenges. Speaking for himself and not the campaign, Kudlow said reconciliation was “the fastest way in our judgment to get necessary pro-growth tax reform.” He said he has been encouraging that path to Trump and his staff all year, and that they were considering it. Trump and House Republicans have proposed different tax plans, but they are largely in sync on major principles. Both would cut the top tax rate for individuals to 33 percent from the current 39.6 percent. The corporate rate would drop to 15 percent under Trump’s plan and 20 percent under the House GOP plan, from 35 percent today. Both plans also would drain federal coffers of several trillion dollars and give the biggest boost to the wealthy. By the end of the decade, the richest 1 percent would have accumulated 99.6 percent of the benefits of the House GOP plan, according to the nonpartisan Tax Policy Center. One drawback to using budget reconciliation as a vehicle for tax cuts is that if the bill increases the deficit after 10 years, the provisions then sunset. That was the case with the Bush tax cuts — though the vast majority were ultimately extended permanently under the Obama administration. The other obvious issue is that pursuing reconciliation is a fundamentally partisan exercise. The bill becomes a “political piñata,” said Douglas Holtz-Eakin, a former director of the Congressional Budget Office. But for some, that’s a feature, not a bug. Ryan’s office didn’t respond to a further request for comment, but he has been vocal about the need to get Trump in the White House to enact his agenda. A crypto-fascist totalitarian in the White House, totalitarian Tea-Publican tyranny in Congress, and a Supreme Court nominee to provide the 5-4 majority needed to put the imprimatur of constitutionality on ending democracy in America. These are the high stakes in this election. Register to vote, and then vote Democratic up and down the ballot. End Tea-Publican tyranny now. Paul Ryan is a follower of Ayn Rand, except when he’s running for office, then he’s a follower of Jebus. Because Ayn Rand hated religion, and the GOTeaP rubes he cons won’t put up with hating on the Sky Daddy. When he’s pretending to be a follower of Jebus, he claims to be Catholic. Unless the Infallible Pope-ster says something bad about Capitalism. Then Paul Ryan lectures his religion’s infallible leader. Paul Ryan wants to kill off Social Security, but he used it to get through school himself. He, like most wanna’ be “makers”, is actually a taker. And his rat-like ways are nothing new. I may have a lower opinion of Paul Ryan than I do of Falcon9, Arpaio, Kavanagh, or Trump.